I can think of no better fun, and practice, than performing duets. 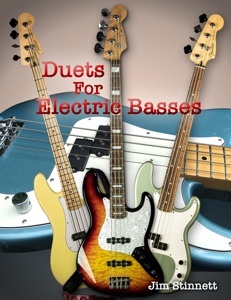 Bass Duets For Electric Basses is a collection of duets, trios, and quartets. Numerous styles are featured, including Rock, Funk, Classical, Latin, Jazz, and even Twelve-Tone. The level of difficulty runs the gamut from simple whole-note melodies to advanced jazz and funk riffs. Never underestimate the simple ones. Do not let the lack of a companion musician stop you from playing duets. To record one line and play the other is quite a valuable exercise. This publication contains 100 pages of music and should provide you with some fun and challenging material. All the songs in this book were written with the electric bass in hand. The videos of each song can be a valuable tool. You do not have to be a good reader to learn the music, just watch the video and copy the parts. There is no better practice for developing your ear and hand coordination.